Greenrose Inc. offers a wide variety of concrete stamps for rent as well as purchase. With over 50 different stamps in our rental inventory you are sure to find something to make your project look awesome. Simply browse thru the following pages to determine what will work best for you. Slate is a sleek, metamorphic rock with fine veining patterns. The grain pattern of slate makes it a common resource for tile flooring because it is easily split into thin sheets. Slate texture tools recreate the elegant, clean design of slate without the expense and hassle of installing fragile natural stones. 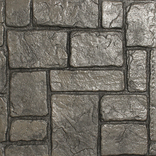 Ashlar texture mats reflect the handcrafted, intricately-fitting stones of historic Ashlar configurations. 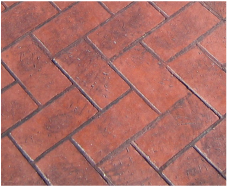 Create the look of brick with out the mess of re grouting or dealing with weeds and grass. This simple but natural looks are timeless and will create beautiful concrete. Texture Skins are feather edged skins that produce continuous texture with no grout or joint lines. They are compatible with stampable overlay and available in a variety of different textures. Whether you want the look of Granite, Blue Stone, Old English Cobblestone, Mexican Tile, or Pavers, we offer an array of texture mats that simulate a broad range of natural stone materials. Achieving these beautiful impressions with precision tools provides an end result that is affordable and often easier to work with than natural materials. 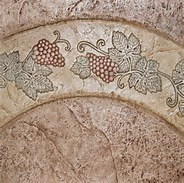 There is a stone texture tool ready to complement any design theme from an Italian Villa to an English Country Garden. Isn't that amazing...yes its concrete! 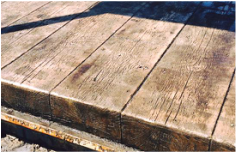 We have several different size and textured wood stamps to create a natural but amazing look in concrete. Why not add more character to your project or dress it up with an elegant border or add a flare of your own with our unique border options.